This is the story of an unusual war memorial built by A.R. 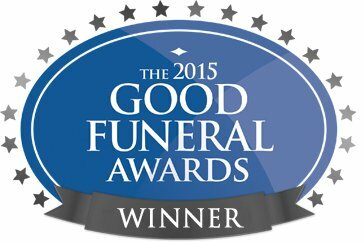 Adams Funeral Directors, drawn from contemporary newspaper accounts. The morning of Wednesday 13th June 1917 was hot and the sky was hazy. Nevertheless, onlookers in London’s East End were able to see ‘a dozen or so big aeroplanes scintillating like huge dragonflies.’ These three-seater bombers were carrying shrapnel bombs; that morning they killed 104 people. This was the first ever daylight air-raid. It was also one of the first civilian tragedies of ‘total’ war and the deaths of the children in particular caught the public’s emotions. 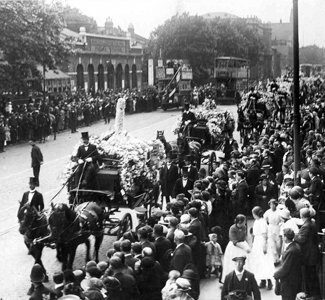 The funerals took place on 20th June 1917 and were a major public event. ‘Signs of sorrow and sympathy were visible throughout the whole of the East End. 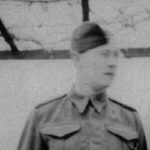 On every hand blinds were drawn, shutters fixed, and flags had been lowered to half-mast. 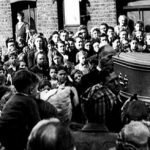 Preceded by the Boys’ Band of the Poplar Training School, the coffins were borne through the vast and silent crowds of people.’ The last coffin held unidentified ‘broken fragments of little bodies’. The memorial was set up in Poplar Recreation Ground. It was built by A.R. Adams and is made from marble and granite, in a Victorian gothic design surmounted by an angel with spread wings and inscribed with the names of the children who died. To this day it arouses emotion in people who stop and look at it. Thank you to http://www.ppu.org.uk/ for their article and research on the story. The funeral service at Poplar Parish Church was conducted by the Bishop of London. Among the mourners were many children, including those who ‘had themselves been extricated from the medley of powdered brick, wood, human flesh and blood in their school building after the bomb explosion’. ‘The early ending’ the Kings message went on, ‘of young innocent lives, at all times pathetic, is made more so in these tragic and cruel circumstances. Their Majesties pray that the mourners may be blessed with God’s help and comfort in their sorrow’. A.R. 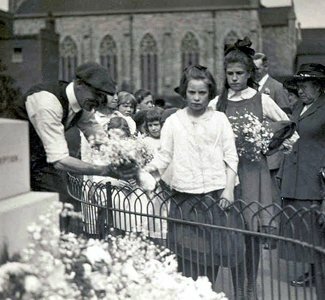 Adams were among the local funeral directors who carried out the funeral services of the children. In June 2017, we were honoured to attend the centennial ceremony which was conducted in the presence of Her Majesty The Queen. We created and donated name plaques for each child for display on a new memorial board.